June is warming up and we are assured that in the next few months we will see plenty of sunshine (cue rain). But rain or extreme heat will confirm a bookworm’s belief that the inside of an air conditioned gallery or the bowels of a bookshop are the best places to be! I have been hearing a lot of good things about the Bawden exhibition at Dulwich which I have trailed previously. I can now add that they have a special late opening on Friday 22 June. Another very well regarded exhibition is that currently on at the House of Illustration entitled ‘Enid Marx: Print, Pattern and Popular Art’. 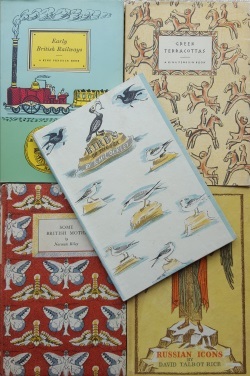 A contemporary of Bawden and Ravillious, Enid Marx was an illustrator, printmaker and textile designer and her book covers will be well known to Penguin collectors. The exhibition runs until 23 September. Has anyone been to see the Ladybird exhibition in Canterbury? It started last weekend and is free; it looks like a fun visit if you have little people with you as there is a selection of family friendly activities (small charge applies). 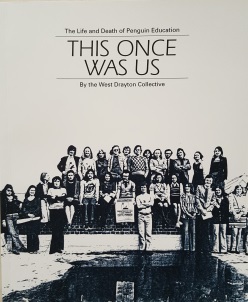 The Penguin Collectors Society Post Graduate Bursary award was made last month and the successful application was Sally Addison. You can read more about the Bursary here and about Sally in the previous Latest News post. On a similar vein, Penguin Random House have announced the shortlist for their Student Design Award 2018 (now in its twelfth year). Final judging is taking place and the winners will be announced 20 June. The books chosen for cover redesign are Animal Farm, A Brief History of Time and Noughts and Crosses. The shortlisted students have also been asked to talk about the concept behind their designs which adds weight to the article. I have added some sites to our Links page which I hope you will find of interest. They include two articles from the very fine Spitalfields Life blog. All the articles by The Gentle Author are excellent value but these are of particular appeal to Penguin collectors. Not included in the links, but worth attention is Mike Dempsey’s blog and I am sharing the first of his series on ‘Branding brands’ which you may have missed. As my final news offering this month, the Penguin English Library series has been receiving a great deal of interest. Most of the titles were released during 2012 with a few coming out in 2014. After a hiatus of four years the most recent batch were published earlier this month and have caused an instagram mini-tempest. The covers have been illustrated and commissioned by Coralie Bickford-Smith who has written on her experience.